After eight years, TVB’s trend setting palace drama War and Beauty <金枝慾孽> is finally green-lighted for a sequel! Production for the sequel began in March 2012 in Hong Kong, before moving to film on location at Hengdian World Studios in June 2012. The cast and crew will will stay there for an entire month. On Tuesday night, Sheren Tang (鄧萃雯) and Moses Chan (陳豪) filmed a light, bittersweet kissing scene under the rain. Embarrassed, Sheren laughed, “It has been awhile since I last came upon such scenarios in both real life and acting, so when we were filming I couldn’t control my laughter.” Moses also did not forget to report to his girlfriend, Aimee Chan (陳茵媺), about the scene! Renamed Beauty at War <金枝慾孽 (貳)>, the War and Beauty sequel is produced by TVB’s golden duo, producer Jonathan Chik (戚其義) and scriptwriter Chow Yuk Ming (周旭明). Although their recent productions were met with poor ratings, War and Beauty swept the 2004 TVB Anniversary Awards in major awards categories. It was arguably the duo’s most successful collaboration. Not only was it a critically acclaimed ratings hit, it also set a trend for palace scheming television dramas. Sheren Tang Demands Too Much? Beauty at War is expected to wrap up filming by mid July 2012.
sheren, ada, moses and also patrick that gonna be guest star and ada right a series needs good acting and a good story like..
i think the male side of the cast is a bit weak. just moses, who doesn’t really have much pulling power on his own. i personally don’t like kenny (as an actor), and he’s only recently been promoted to 2nd lead. I agree with you that the female cast is not weak. But, the male lead only has Moses. I like Eddie Kwan myself and I know he played lead roles in the 80s and 90s. But, he’s not as famous now. In Ghetto Justice, he’s the only one of the 4 Shum Shui Po gang who does not have his own proper subplot. anonink didn’t even think of him when he/she list the male leads. Agree. “War & Beauty 2” needs at least one more strong lead actor. Eddie Kwan is a bit too old to be the 2nd lead artiste. He is also too tall to act the role of a female Chinese opera singer in the drama series. Even the actors are old. Eddie Kwan still looks young and he can act. If just put in a younger actor doesn’t balance well with the much older actresses. Why is it in such abundance in China production and yet none in TVB? Come to think of it Ada played her own age in Empresses in the palace. The actresses are old but since the younger actresses can’t carry this series as good as Ada and Sheren, why bother with the younger ones? Meanwhile other than bulging eye Myolie and TY, Fala has low charisma and Linda look like a lost modern world crybaby. Kate will look like a crazy villain from the future. I’m not sure if I’ll be impressed with this series’ performance but I simply have a thought that this series is full of gannies and those old uncle stuff….. yucks…! You must be fairly young and are only interested in those idol artistes who cannot act. “War & Beauty” was a classic drama series, and its sequel needs to be done by the same good artistes. If you care about good acting, you will not worry about the age of an artiste. In 2004, TVB didn’t have best Series Award. so that “War and Beauty” never gets this award. Thanks for the note; we have revised article accordingly. Never believe in Wikimedia. TVB gave the “Best Series” awards from 1997 to 1998 and this title was out from 1999 to 2004. In 2005, TVB once again created this award again and “War Of In-Laws” got it and it’s still up to now. Once more thing, “Dai Cheung Kam” was broadcasted in 2005, in the year of “War Of In-Laws” and “Life Made Simple” not in 2004. In 2004, the highest rating series is “To catch the uncatchable” not “War and Beauty”. So what happened to Sheren and Ada’s sharing of a kiss? And War & Beauty, now Beauty At War, third series is Beauty War? 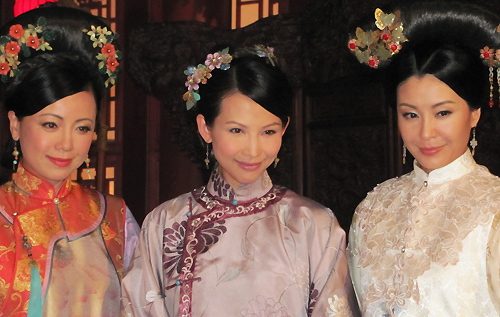 The problem with TVB at such series is there is a serious lack of younger actresses to play young concubines realistically. So they had to depend on the older much experienced actresses so I hope this series begins with everyone already in the palace as concubines for a number of years. Probably would have been better to call it “Cold Palace”. i want to see that scene too. i guess it’s not gonna happen because it’s inappropriate. Nah Ada, Sheren and Christine are all top line actresses, it’s just that there’s not enough top line actresses in this series. Seriously…they only have Moses as the male lead? Bad move! They need more good looking guys, to balance up the great female cast! With Bowie it’ll be much better! Perhaps TVB should have move the era to a different dynasty instead of the over used Qing. I mean Ada was in Empresses In The Palace where the role suited her and that is Qing. Everybody is like Qing dynasty these days. Why not Sung? Ming? Han? Qin?! I find both ‘When Heaven Burns’ and ‘4 In Love’ to be good series especially WHB. Can comment about MOP yet because I have not finish watching it. TVB was over using Moses, they just lash him into really bad series with lousy scripts!!! Ada looks great in the pic above. Very youthful! check your points. Moses is in all these series because CKY and CYM duo loves him and want to give him good roles. Geez. This series has strong cast with the 3 beauty Ada, Christine and Sheren. Really looking forward to the series and hope the story will not disappointed any fans as the 1st one was really good. I still don’t like Moses and his acting. I think Steven Ma would have been a good addition to the cast as well but too bad he has already left TVB.